Home / Blog / Need a Glow in the Dark Jersey to Go With Your Glow in the Dark Boots? Need a Glow in the Dark Jersey to Go With Your Glow in the Dark Boots? If you are thinking about picking up a new jersey, you might want to check out the 3rd kit that the great FC St Pauli currently has on offer. Adidas did the biz with the recent “Hunt Pack“, adding glow in the dark technology to boots. 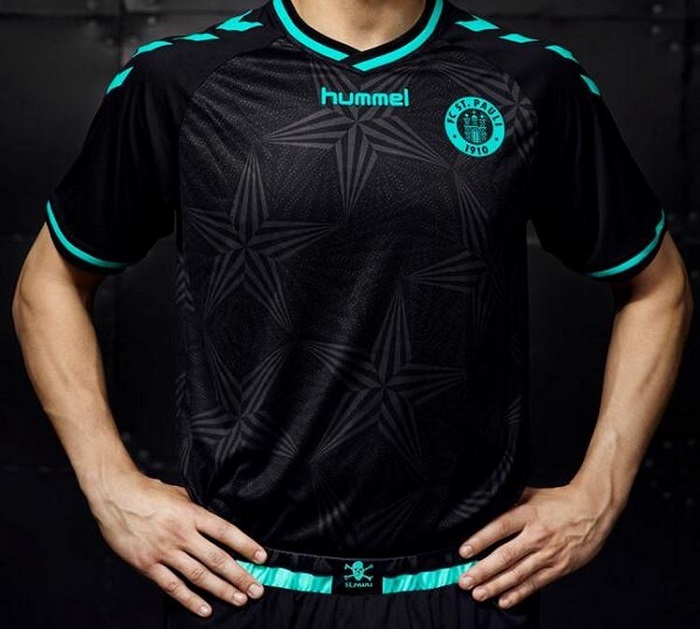 Well, Hummel has has also upped their game by adding a similar pattern to a kit. So now, you can be glow in the dark compatible from head to toe! The color trim used is a mint green, with the kit also featuring a glow-in-the-dark badge. The great legacy of your favorite club is reflected in the design of ST PAULI 3RD JERSEY. The QR code, star line in the neck area, glow-in-the-dark details along with the overall star pattern gives this jersey an authentic look. Side note, St Pauli are one of the most interesting teams in the world. The club and its supporters have adopted an outspoken stance against racism, fascism, sexism, and homophobia and has embodied this position in its constitution. The club also prides itself on having the largest number of female fans in all of German football! You can find the kit over at Hummel.